Monday 11th February 2019 marks this year’s International Day of women and girls in science. The contribution of women to science is often downplayed and goes somewhat unnoticed. Perhaps the most striking example of this is the life and work of Emmy Noether — the woman who saved general relativity. From its inception in 1915, General Relativity, a new geometric way of thinking about gravity had captured the attention of physicists with both its beauty and the threat it represented to the paradigms of physics. But it was not without its problems, difficulties which even Einstein could not resolve. We would likely not be celebrating this landmark theory were it not for a mathematician who, at her prime, couldn’t even secure a teaching role in her homeland because of her gender. This is how Emmy Noether saved General Relativity. The date of July 23rd 1918 marked the day in which two theorems that would go on to be applied to General Relativity and lead to its common acceptance amongst physicists were unveiled. Named ‘Noether’s First & Second Theorems’ they not only resolved a nagging problem in relativity but also created a new field of abstract algebra. Whilst physics as a field was divided over General Relativity, its supporters had a hurdle to overcome. They had to admit that there was a hole in the theory. Whilst energy conservation laws held nicely in Einstein’s theory of Special Relativity, which concerned itself with a flat space-time, those same laws seemed to break down in the curved space-time of General Relativity. Two supporters of General Relativity, David Hilbert and Felix Klein, mathematicians at the University of Göttingen, in particular, were driven to iron out its quirks. In particular, they couldn’t figure out how the conservation of energy fit into the theory. They couldn’t surmount the mathematical challenge. Fortunately, Hilbert was aware of someone that could. Hilbert and Klein brought Emmy Noether to Göttingen to tackle General Relativity, believing that her mathematical background and experience with invariants could be useful in solving its challenges. To understand why Noether’s work is so significant to physics it is useful to explore concepts which lie at the intersection of mathematics and physics. Symmetry and conservation laws. The symmetry of conservation laws. Noether’s First Theorem. It is pretty easy to understand what symmetry is in mathematics, the easiest way to illustrate it is to look at two very simple equations. The first that is not symmetric. The second that is. Take y=x. This is an equation that isn’t symmetric. 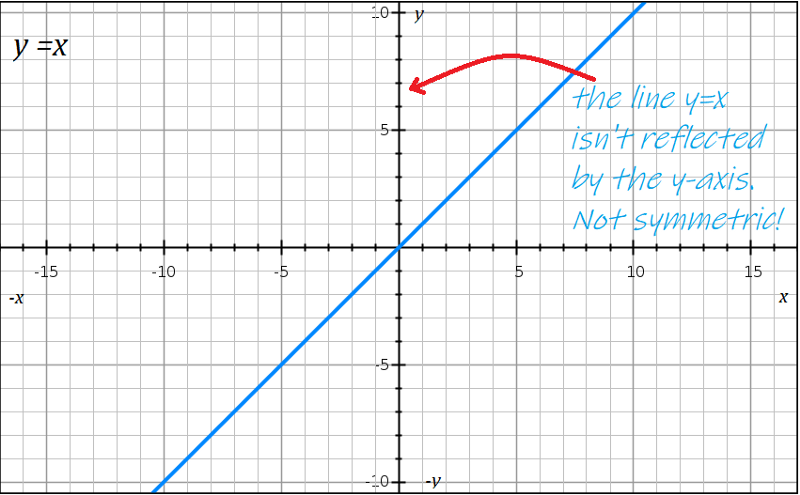 Changing x to -x doesn’t produce a physical representation for which the y-axis can act as a line of symmetry. 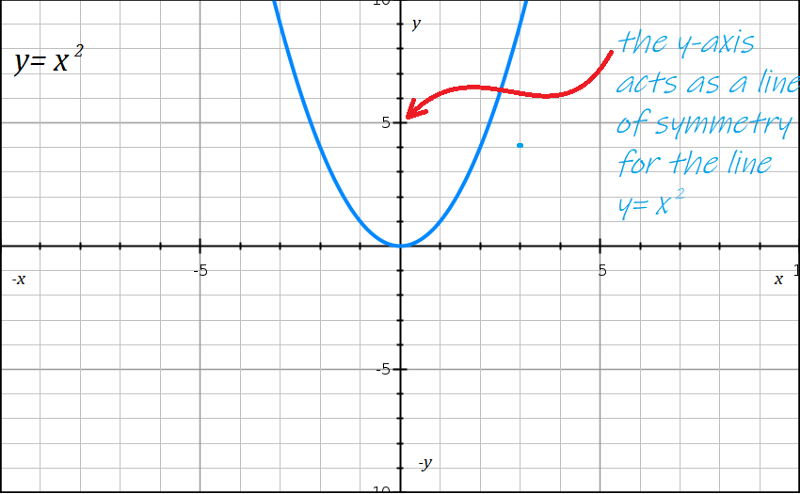 Compare this to the equation y = x² which is symmetric. The y-axis acts of a line of symmetry. Thus replacing x with -x doesn’t actually make a difference to the value of y. To understand the physical significance of this, consider x as a function of position. Noether showed that General Relativity was subject to a new type of conservation law, one which will be instantly familiar to any final year physics students. She described it as a theory that was ‘generally covariant’. The principle of general covariance is essentially an extension of part of the basis of Einstein’s theory of Special Relativity — the idea that physical laws should take the same form in all inertial frames. Observers may not agree on coordinates of events or even the times at which those events occur, but they should always agree on the laws that govern those events. This implies that these laws should be ‘form-invariant’ under Lorentz transformations. Physicists could show this by writing the laws as mathematical objects called four-tensors. The fact that Newtonian laws of gravity can’t be written as a four-vector relation was what persuaded Einstein to begin work on General Relativity in the first place. There should be a geometrical theory, one governed by equations that will not vary when under acceleration, as both sides of the equation change in sync. This explained why General Relativity’s conservation laws seemed trivial, essentially like writing 0 = 0. Noether concluded that all generally covariant theories would have this characteristic. The laws of conversation would be invariant under coordinate transformations. The finding became known as ‘Noether’s second theorem’. 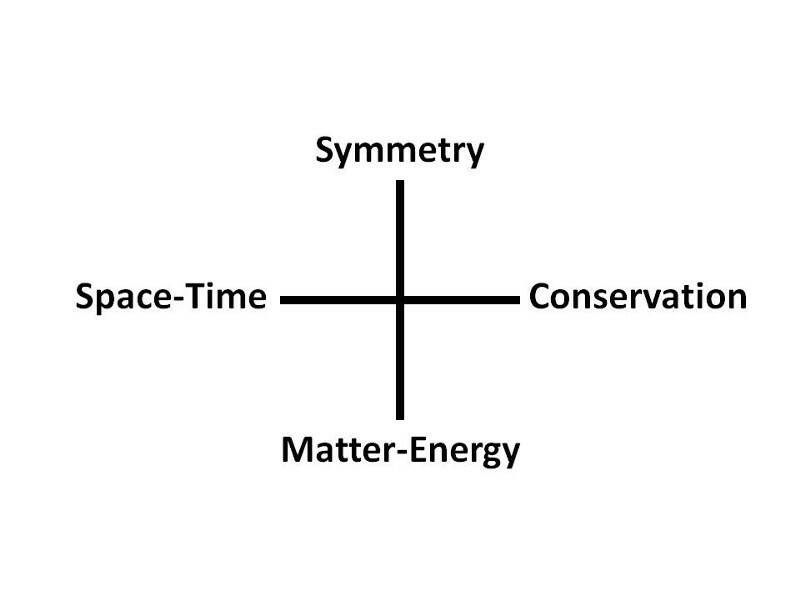 The breakthrough of Noether’s second theorem allowed Noether to develop a mathematical proof for her first theorem, linking symmetry to conservation laws in physics. She presented her findings at Göttingen Mathematical Society on July 23rd 1918 and then later in a paper published in the journal Göttinger Nachrichten. These were the mathematical breakthroughs that general relativity needed to win over physicists. With these issues resolved the scientific community was more likely to consider seriously this paradigm-shattering theory. More than this, Noether’s theorems proved a more general point in physics and its relationship with mathematics. All conservation laws were explicitly tied to mathematical symmetry. More concisely, Noether’s first theorem states: If a system has a continuous symmetry property, then there are corresponding quantities whose values are conserved in time. The theorems led Einstein to declare in 1935 that Noether was “the most significant creative mathematical genius thus far produced since the higher education of women began.” Whilst this is no faint praise, especially considering the source, it also encapsulates the saddest element of Emmy’s life and contribution to maths and science. She simply couldn’t be considered by her peers as just a mathematical genius. She was a mathematical genius AND a woman. Emmy was born on March 23rd 1882, the first child of Max and Amalie Noether. Whilst Emmy’s mother came from a long line of celebrated Phds, her father was the first person in his line of ironworkers to earn that honour. After earning his doctorate from the University of Heidelberg, Max had become a distinguished mathematician, primarily responsible for founding a program that would study invariance, transformations and geometry. The same field Emmy would revolutionise. As well as creating an environment that would no-doubt lead Emmy to consider invariance, her father would also have another profound impact on her work; it was him that brought David Hilbert — who would later champion Emmy — to Göttingen. Emmy would not immediately follow her calling to mathematics, however. She initially began her life in academia studying languages, piano and dance at the städtische höhere Töchterschule from 1889 to 1896. She had initially planned to on to teach French English passing the Bavarian state examination in 1890. Of course, her teaching would have been restricted to schools for women. Emmy was allowed to sit in lectures and classes — she was one of two women doing so amongst 986 students — even if she couldn’t matriculate. She did this from 1900 to 1902, passing the matura examination in July 1903. Later that year she would attend lectures at the University of Göttingen held by some of the most significant names in maths and physics — Karl Schwarzschild, Herman Minkowski, Felix Klein and David Hilbert. She as finally able to embark on her studies officially at Erlangen University in 1904, earning her PhD in 1907 Academic order was not overthrown. During her career as an eminent mathematician, she would not only come to the aid of general relativity but also would become known as “the mother of abstract algebra” developing the general theory of ideals and the concept of Noetherian rings as well as excelling in noncommunicative algebra and hypercomplex numbers. Unfortunately, her struggles against those who had a firm idea of what a women’s place in society should be would continue throughout her career as it had in her studies. For seven years, between 1908 and 1915, she worked for free at the Erlangen Mathematical Institute because she couldn’t find an institute that would pay a woman to teach mathematics. 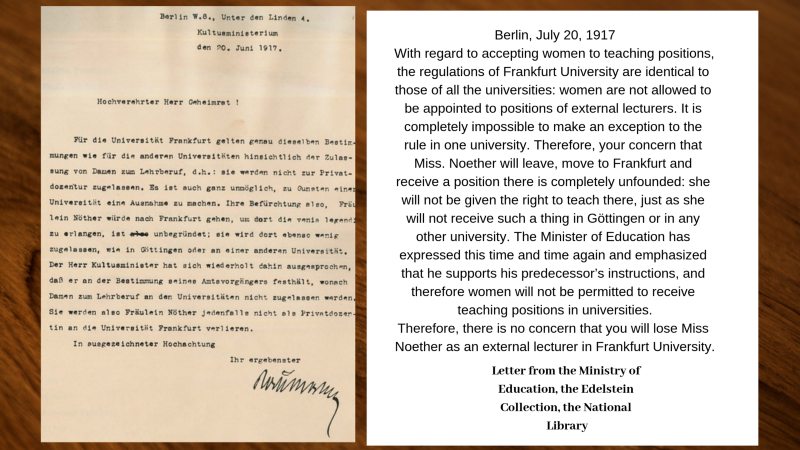 After her work on general relativity, both Hilbert and now Einstein would continue to champion Noether and the ridiculous prejudice that kept her from her proper place in academia receiving responses similar to the one recreated below. After lecturing in place of her ailing father, Emmy was finally allowed to lecture under her own name in 1919, becoming an “unofficial associate professor” in 1922, and finally becoming an associate professor at Göttingenin 1931. Noether’s life was to be affected by ignorance and intolerance once again by the rise of fascism in Europe. When Hilter and the Nazi government seized control of the learning institutes of Germany she was fired alongside other Jewish professors. She moved to Bryn Mewr College in Pennsylvania, where, by all accounts, she finally began to receive the respect she deserved as one of the finest mathematicians of the time. 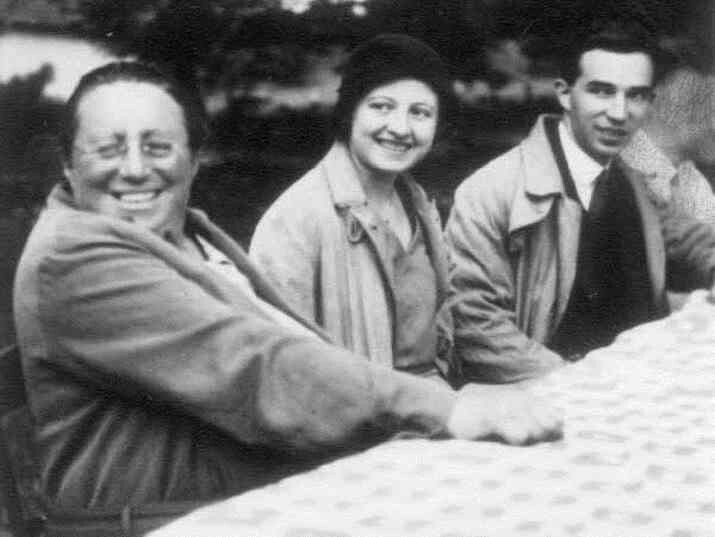 In 1935, Noether was offered a place at Princeton University, where she was to reunite with Einstein. Who knows how such collaboration between these two could have shaped science for decades to come, had fate not intervened. Noether underwent surgery on April 10th, 1935, to remove a tumour. Despite being a routine procedure, it resulted in her slipping into a coma shortly afterwards. She passed away on 14th April 1935, at just 57 years of age. She is remembered by the Emmy Noether Lecture, established by the Association for Women Mathematicians in 1980 to honour women who have made substantial contributions to the mathematical sciences. Despite all of her achievements and the fact she changed science and mathematics forever, it is disheartening to consider how if society had enforced its will on Noether, she likely would never have reached the University of Göttingen to provide general relativity with the mathematical ammunition to topple Newton’s theory of gravity. The fact that she had to be championed by a series of male counterparts just to be taken seriously is sobering, to say the least, just look at how few women have factored into Noether’s story which I have briefly recapped above. There’s no doubt that despite being described as a most affable person, Noether must have had a great deal of determination to overcome the difficulties and hurdles placed in front of her. Whilst women in science today will not face such obvious discrimination, there is still an intrinsic prejudice that they have to overcome that their male compatriots do not have to face. That is why days like the ‘International Day of women and girls in science’ are so crucial. Who knows how many geniuses have been swept aside by ignorance and intolerance?